Two Acorns. One with and one without a Wasp Gall, Ingoldsby Garden 2018.
two acorns- one wasp gall, iPad, Apple Pencil and Procreate drawing. The single Ingoldsby Garden oak tree has an abundance of acorns. However some of the smooth oval acorn seeds are engulfed by brown and red rough crustation-like growths. This was a surprise! Their naturally uniform oval shape set securely in matching cups, are in deep contrast to the encroaching eccentric growths more akin to shapes of cooled volcanic eruptions. Even more of a surprise was to know that these growths are ‘Galls’, similar to those is episode 5, that have been used for inks throughout the ages. And the final surprise is that the galls are the result of ‘Gall Wasps’ laying their eggs on the acorn seed knowing that that they will be encapsulated by the growth in preparation for fertilisation and incubation over the coming winter. 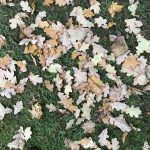 Come the autumn, they will drop into the grass and leaves below to weather the winter. 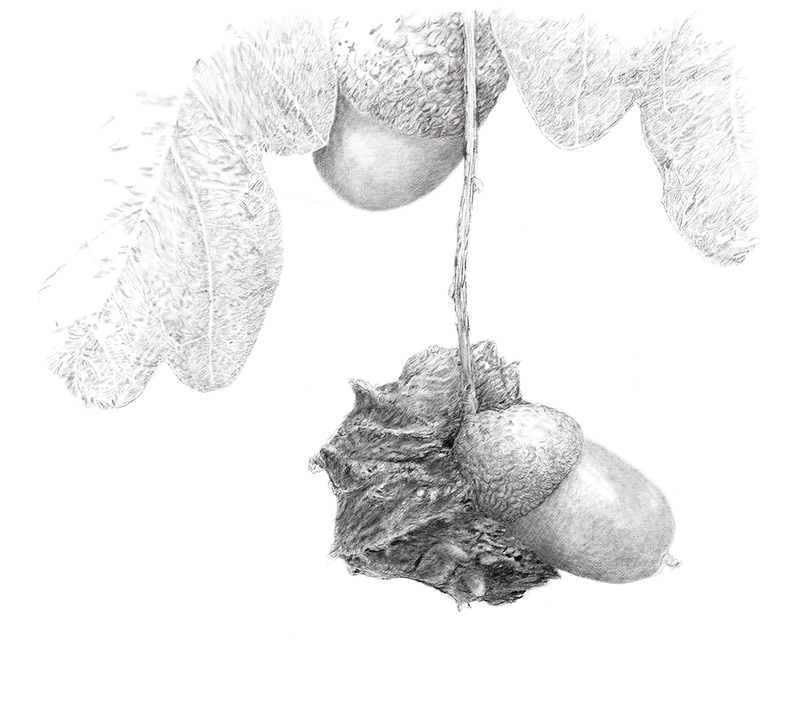 The contrast provides a dramatic subject for a new fruit drawing: an engulfed acorn hanging underneath an unaffected acorn, flanked by oak tree leaves. Basic research reveals that different species of gall wasp develop inside the galls affecting various structures on the tree. Oak gall wasps have complex life cycles, with alternating generations that are either sexual with males and females, or asexual with females only. The two generations often produce different types of gall on different parts of the tree. In November when the leaves had turned and fallen a search of the undergrowth reveals a number of galls. Acorn and Gall placed with oak leaves in a pot for the winter and spring review. Further internet research has revealed the following observations. Some populist, but some tangible and substantially academic. Iron gall ink has been used since the middle-ages and is found on many of our most treasured collections including the Lindisfarne Gospels, Beowulf and the Magna Carta. During our final visit to the woods last week, we made a crude ink from acorn galls. This post will look at the process behind the formation of these galls, and the science involved in producing the ink. 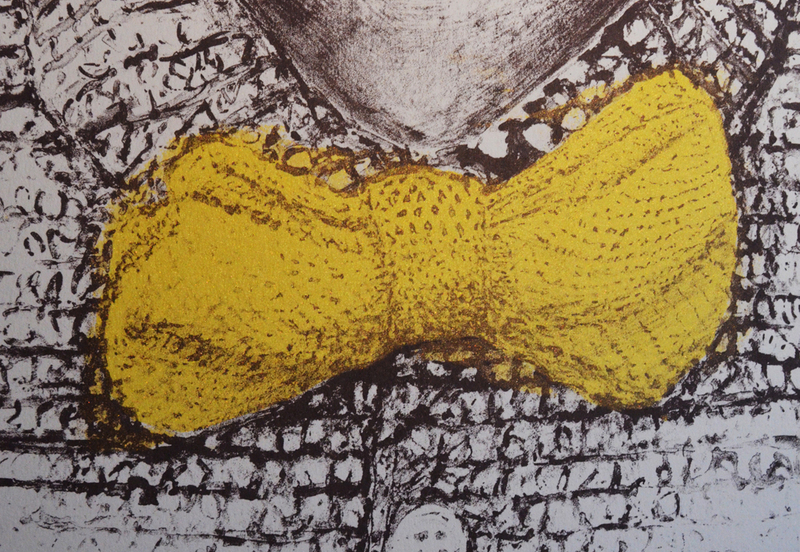 Continuing the internet searches throws up a contemporary digital creative site with detailed visuals of the Galls, wasps and larvae-from analogue ink writings and illustrations to digital information. ‘As we move into late summer, fruits and nuts seem to be forming everywhere in all sorts of shapes and colors. While walking through London, these oddly-shaped green acorns caught my eye, with their ridges, knobs and slightly sticky appearance. On closer inspection, most of the acorns were covered with these intricate, ridged growths, called Knopper Galls. The galls result from a chemical reaction in response to the gall wasp (Andricus quercuscalicis), which lays its eggs on the developing acorns. The shapes and textures of the resulting galls are fascinating (and quite variable). 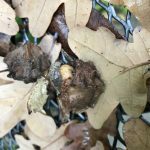 The degree of ridging on the gall is thought to be related to the number of larvae competing within the gall and we found as many as three separate galls on a single developing acorn. Their name “Knopper Galls” comes is thought to be derived from the English word ‘knop’, meaning “a small rounded protuberance, boss, stud, button, tassel or the like” and German ‘knoppe’ meaning “a kind of felt cap or helmet worn during the 17th-century”. 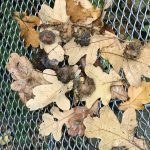 This NOTCOT post is well worth visiting for information, visualisations and inspiration and brings my knowledge of the surprising acorn growth up to date. Science, biology and art. NOTCOT sites have become the daily sources of inspiration for creatives everywhere, fighting the good fight against “creative block” since 2005 with visually stunning imagery, the latest in international trends, and a passion for all things well designed. NOTCOT.ORG is a community of creatives, design lovers, and trendsetters – where .org serves as the studio bulletin board gone digital – each image and caption brings you to a place worth visiting. It’s about sharing what inspires you. This is the PICTUREBOOK to their novel. NOTCOT.COM is the editorial face of NOTCOT, offering in-depth features on products, artists, technology, innovation, and up-and-coming trends. “The Little Acorn” story featured here is by Lucy Wheelock and appears in her collection of short stories titled The Kindergarten Children’s Hour, Volume 1: Stories for Little Children. As featured on story hour. All of which is in contrast with the Wasp Galls. These series of fruit drawings began before a recent Neck surgery operation, however they have become a regular positive home recovery focus. Staying at home with few opportunities to make external ventures has enabled me to focus on digital drawing of natural growths in the passing of the summer into autumn season. It has also encouraged research into the nature of tree fruits and the surprising ‘new-to-me’ knowledge of Galls. 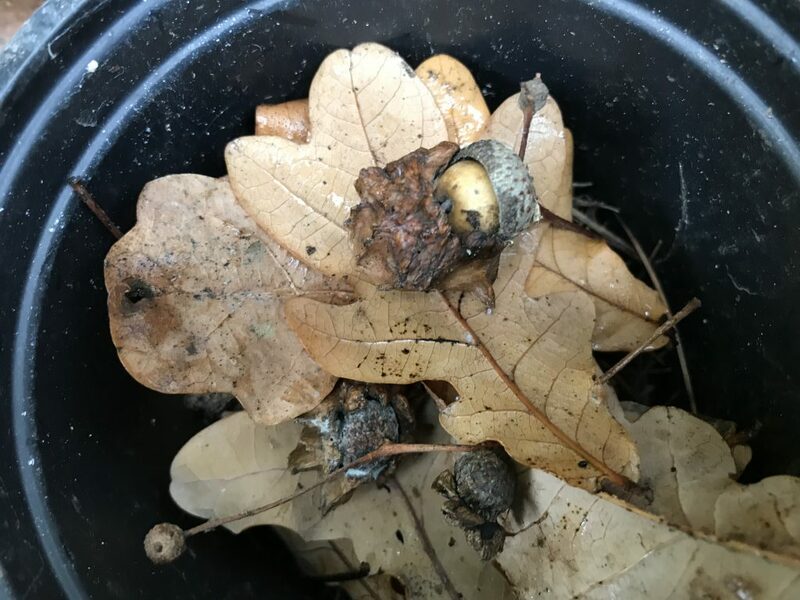 The oak gall and rough wasp gall that grow on the smooth acorn seed as well as being protective homes for the winter growth of the wasp and insect have a long history of being converted into dark ink for writing and illustrating. This is a valuable observation as I contemplate venturing out to returnto my PhD research into contemporary portraiture and the dichotomy between analogue and digital drawing.